If you are an outdoor sports enthusiast, how will you make well-equipped preparation for outdoor activities? Undoubtedly, this Flexible Zoom Highlight Outdoor Lighting Aircraft Head Headlamp is a necessary. With high quality material and unique appearance, it looks fashionable and fantastic. Meanwhile, compact size allows you to take it anywhere and the rational design lets you wear it comfortably. And it has low power consumption and can also keep working for a long time. In brief, it is a good helper for riding, camping and hiking, which will make fully entertain yourself outdoors. Take the chance now, it will exceed your expectation! 6. Focus function that allows the beam can be focused. 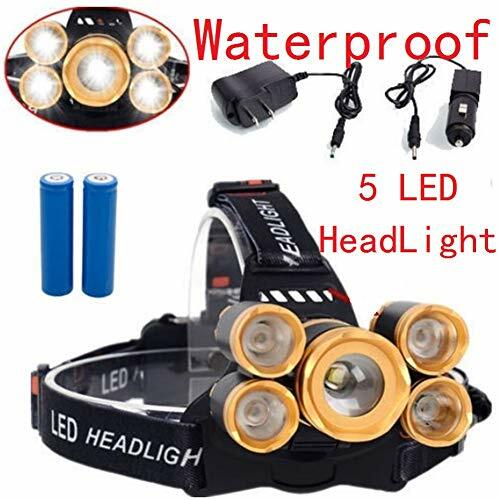 [Super Bright Headlight]: This LED headlight has 5 LEDs and has 4 working modes. The chip is XML T6. 80000 LM, super high brightness and high performance. [USB Rechargeable]: The head flashlight is charged by the USB cable and includes two 18650 rechargeable batteries. The working time after full charging is 4-12 hours. [IPX4 Waterproof]: The lamp is made of aluminum alloy, IPX4 waterproof performance, LED headlights are waterproof in rainy days. But remember not to leave it in the water. Working underwater is not a diving headlight. [Zoom Headlights]: LED headlights can be zoomed. It allows you to point the light source at 90 degrees in the desired direction and adjust the focus. [90-degree Rotation] The headlights can be rotated 90 degrees, and the straps can be adjusted. The viewing angle is adjustable, so you won't feel tired when using the headlamps. If you have any questions about this product by TOBABYFAT, contact us by completing and submitting the form below. If you are looking for a specif part number, please include it with your message.